I use this with my beginner kids class. I call out a letter and they have to find it and write over it in pencil. 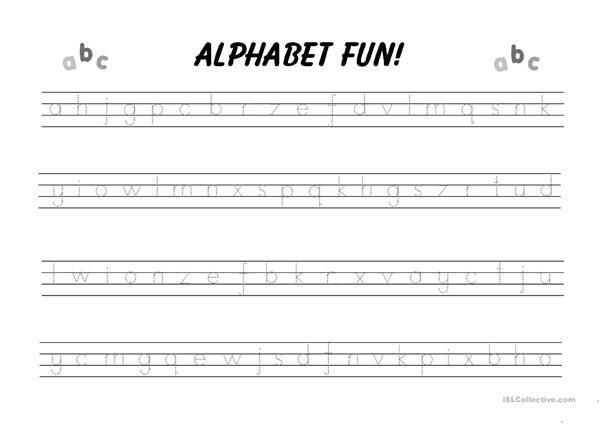 It's great for practicing letter recognition. Once we've learnt colours, I include those as well. This printable, downloadable handout is best suited for kindergartners and nursery school students at Beginner (pre-A1) level. It is useful for enhancing your pupils' Listening and Writing skills. HannahB is from/lives in United Kingdom and has been a member of iSLCollective since 2011-10-03 20:07:26. HannahB last logged in on 2012-01-08 07:24:43, and has shared 1 resources on iSLCollective so far.